Howdy ho! JB here, filling in for Tw1zm, who has suffered technical difficulties. 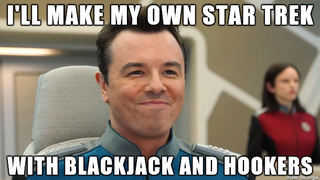 Ladies and gents,I am officially a fan of The Orville. There, I said it. This show just clicks with me in the same exact way Star Trek: TNG did. I tuned in expecting “Family Guy in Space Again”, and what I received has been my favorite Star Trek in recent memory, and it isn’t even Trek. So, today’s topic: Have you ever been surprised by a show being completely different from your expectations? What was it, and why? Were you happy or saddened? Give us your thoughts about this, or nearly anything else you’d like in the comments below!